What a hard working 2 weeks this has been. We've spent this weekend working in the garden, getting our winter crops in order and harvesting the last of our summer crops. We have fresh corn for supper tonight, I have chillies on the notch and red and green capsicums growing. There is something good about making things so Graham should be feeling great now as we spent this weekend finishing our Garden project. 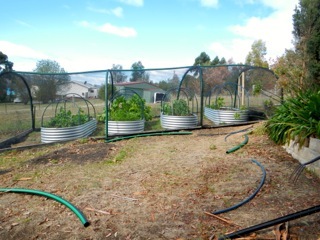 He's made a mega structure at the bottom of our property last weekend with hoops of giant agriculture pipe, netting and hundreds of zap straps, which our 4 raised garden beds now reside in. Elwood isn't sure why he can't walk through the black netting like he can the mosquito net magnetised door we have between the garage and the house, but he'll get it soon. He had us laughing a lot during construction with his antics around the netting… and he's not convinced this is good thing as he can't get me to throw the ball for him every 2 minutes. Today we dis assembled the wooden structure which used to house a garden up by the house, but now houses a water tank, and took it down to the structure to secure the bottom of the netting. Yesterday was netting stringing day, today we completed the end wall with the door, which Graham constructed today. I think this structure looks great, and will start to refer to it as the summer house. 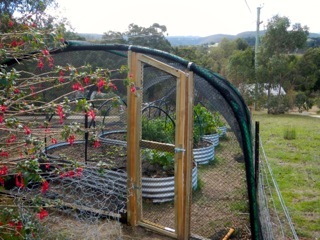 Graham's home made door looks very artsy, and the netting seems to make the garden disappear. I'm grateful I don't have to lift the nets on each little bed every time I do anything now which is a bonus, and will save my back, and I had to jump back as the plants absolutely exploded as they were released from the constraints of their individual netting. We have peas, beets, carrots, lettuce and brocollini growing, the garlic and spinach I just put in, so I'm hopeful we'll have another good winter harvest. Next weekend it's gravel the inside and tidy the yard. Whew, I'm pooped.